Currently viewing the tag: "Synth Rock"
Every now and then, a band comes along and I'm utterly at a loss for how to classify them in the official Steel Druhm Book O™ Metal [That's what you get for not using the Angry Book o' Metal Classifications, n00b. - AMG]. Generally, this causes me anger and vexation, but I always give a nod of appreciation for the bands that resist easy classification. 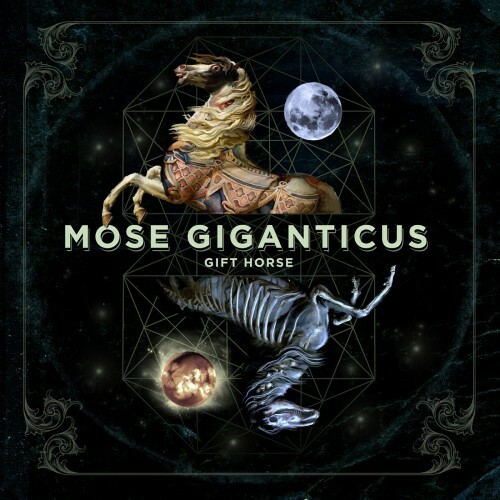 The latest recipient of the nod is Gift Horse, the second album by Mose Giganticus, for they have truly baffled my considerable pigeonholing acumen. They have forced even me to admit I'm stumped. Mose Giganticus is apparently a one-man entity created by Matthew Garfield, a staple of the Philly punk rock scene for some time. While some of that punk ethos is apparent on Gift Horse, this isn't exactly a punk album. What is it then? Good question!! Let's try to piece this puzzle together shall we.